1. Get your own estimate from an independent roofer/estimator before the insurance adjuster conducts an inspection. 2. Cooperate with the adjuster when he or she conducts their inspection—you have a contractual obligation to cooperate. But make sure you advise them that you are unsure of all of your damage and that the insurance company needs to evaluate all potential losses. 3. Take note of whether the adjuster (a) physically gets on the roof, (b) gets in your attic or crawl space, (c) comes inside the house, and (d) how much time the adjuster spends conducting their inspection. Write down these observations and keep them somewhere, or email yourself with the information. 4. Does your adjuster spend time asking about the history of your roof or its age? Remember, your carrier agreed to insure your roof and property—and took your premiums. It did not take issue with the age of your roof or its quality at the time it issued a policy and cashed your premium payments. Do not allow your carrier to deny a claim because “it was just an old roof and was more likely to get damaged”. The age of the roof does not matter! 5. Cosmetic damage is enough! You do not need a leaky roof to make a claim. If hail splatters or wind makes your roof look bad, that’s a claim. Just like dents on your car are covered, so, too, is cosmetic damage to your roof and your home. 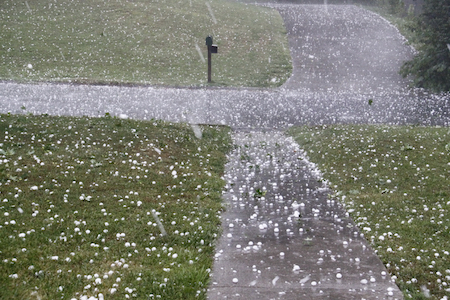 Hail damage will undermine your home’s value. Make a claim. You pay for this coverage, and insurance companies make billions off of homeowners that do not make a claim or are wrongfully denied. Insurance companies count on profiting off of their insureds that do not know how to navigate the bureaucracy that is the insurance claims process.